During an Nvidia event held today, Nvidia CEO Jen-Hsun Huang discussed a new feature that'll supposedly make your amazing, video game-related exploits all the more believable to your dubious friends: ShadowPlay . The new feature is like a DVR for games. As you're playing, ShadowPlay will record up to the last 20 minutes of 1080p footage in a temporary file. If you encounter moment that will shock and awe humanity for generations to come, you can type a quick shortcut telling ShadowPlay to save that footage. There's also a “manual mode” that acts similarly to FRAPS, where your computer will record until you either hit “stop” or run out of disc space. ShadowPlay uses the H.264 encoder built into all of Nvidia's Kepler GPUs (GTX 600 series or higher), which the company says minimizes the performance hit you'd experience on other video capture applications. 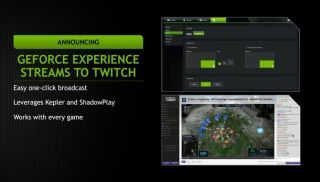 Nvidia says the ShadowPlay beta will be available with GeForce Experience 1.7 on Oct. 28. Nvidia also said it's planning to add Twitch support to ShadowPlay in the near future, though only gave the nebulous release window of “soon.” I suppose we'll just have to toy around with everything else in the meantime.